According to the Cornell Chronicle issue dated June 21, 2013, scientists at the university have identified the exact changes that turn a harmless virus into the deadly virus responsible for feline infectious peritonitis (FIP). This is a major breakthrough, as research has been going on for 30+ years in hopes of finding the mutation that causes the virus. FIP is a disease of the intestines, affecting domestic as well as wild cats worldwide. It has two forms: wet and dry. The wet form is characterized by fluid accumulating in the abdomen, while the dry form includes small masses which appear on various organs. While it may be possible to extend the life of a cat infected with the dry form, one with the wet form usually dies within a few months of diagnosis. Sometimes within days. Until the Cornell University research, no one knew what turned the coronavirus into FIP. It’s recently been discovered that a particular mutant cell common to coronavirus will infiltrate white blood cells. The speed at which this mutant cell travels causes the cat to be unable to fight off the virus. Virology professor Gary Whittaker believes the new breakthrough in identifying the mutant cells will lead to saving the lives of humans and ferrets, who are also susceptible to coronaviruses. For the first time in 30 years, it may now be possible to develop effective treatments and vaccines to save a cat from dying from what until now has been seen as a death sentence. FIP is a reaction to the mutation caused by the coronavirus. And the coronavirus statistics are very high in households with multiple cats. Up to 40% in one or two cat households, and as much as 100% in crowded shelters and feral colonies or homes with many cats. One of the problems associated with both forms of FIP is a fever that won’t respond to antibiotic therapy. Cats with FIP lose their appetite, their energy and eventually their body mass. IF they live long enough after diagnosis for all of these to occur. There is an intranasal vaccine available, but it’s use is controversial. According to the 2000 Report of the American Association of Feline Practitioners and Academy of Feline Medicine Advisory Panel on Feline Vaccines it was stated “at this time, there is no evidence that the vaccine induces clinically relevant protection, and its use is not recommended.” More recent studies on the FIP vaccine still don’t recommend it. Not only does it have some nasty side effects, it’s also not very effective. FIP is one of the scariest diseases out there for cats. Treatment revolves around keeping the cat comfortable for the time it has left to live. It’s been a difficult disease to diagnose, as it’s been unable to distinguish FIP from coronavirus in lab tests. Most cases are diagnosed by vets either based on a cats symptoms, fluid samples or organ biopsies. Some have been diagnosed through necropsy after the cat has died from the disease. I like to stay up to date on advances in FIP. Both as a reporter as well as a cat owner who lost a very precious cat named Tramp to FIP back in 1993. There’s nothing more heartbreaking than to receive a diagnosis of FIP, knowing traditional treatment would only extend the cats life. Most cat lovers I’ve spoken with on this disease had the same hopes I did when faced with a cat who had developed this disease. We each think we will have one of the very few cats to ever survive FIP. And I do mean very few, as the death rate is close to 100%. You feel helpless as you try to make your cat comfortable, even though you know you can only provide love and compassion as you watch the disease progress. Hopefully this breakthrough by Cornell University means possible irradiation in the not too distant future. This entry was posted in FIP and tagged feline infectious peritonitis, FIP by Elisa Black-Taylor. Bookmark the permalink. I see your point Michael – what was the true motivation. We don’t know for sure I guess but if money is involved in research it’s likely to be for humans. This is great news regardless – I truly hope they don’t infect cats with FIP on purpose though. 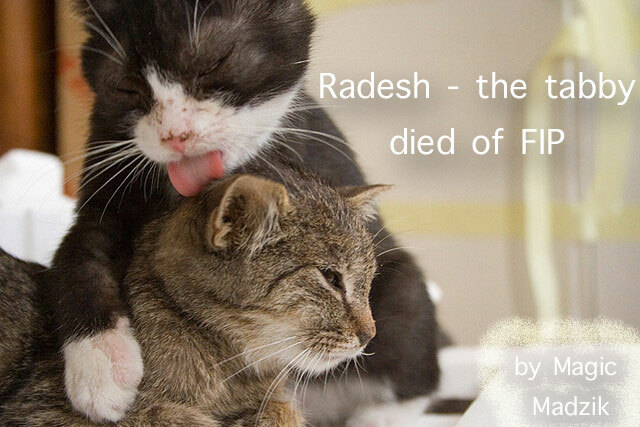 Reading about Fred dying of FIP on coveredincathair was increibly sad. It must be extremely hard to watch a kitten go from playing with its siblings to being unable to and looking all confused as to why he or she can’t just get up and play, and then to watch it’s siblings slowly give up trying to play, also looking confused why their sibling has just slowed down immeasurably. Heartbreaking. There’s no other word for it. Where money is spent on medical research it is difficult for me to believe it is solely for the benefit of the cat 😉 Normally the only connection between medical research and cats is that cats are laboratory animals. Let’s hear it for Cornell! This is outstanding, Elisa. Thank you for briefing us on the breakthrough. By the way, beautiful campus there in Ithaca. Took my honeymoon there yrs ago, as my husband and I were growing French-American hybrid and vinifera grapes. (He came down with the flu, so I traipsed over to the campus to visit w/professors (Dr Robert Pool et al). Had a wonderful time–the visual images flying through my head right now. Wow. Sorry for the ramble. You just put sunshine in my day, Elisa. 😀 Thank you! Hey, between rambling and sticking my foot in my mouth….well…you all know how I am. Told Michael I hope he likes my reporter style. I’m literally writing 7+ hours a day as I’m helping get the puppy mill victims help. I can’t switch my style back and forth like I used to. The stories continue to fall into my lap once an hour. Hopefully the next one will be good news too. It’s not a cure, but it’s a step in the right direction. It makes me wonder whether this will tie into a cancer cure or something once more study is done. Mutant cell sounds a lot like what happens with cancer. ..will lead to saving the lives of humans and ferrets, who are also susceptible to coronaviruses. From what I understand it was done to benefit cats. The way I read it made it sound like humans can get a form of the coronavirus and the research may help treat them. And ferrets are a lot like cats. We had a ferret for a short time back around 2000 and the cat and it would play together. I also believe research into FIV and FeLV may eventually help those with HIV. If a cat can throw off FeLV after testing positive and then test negative there’s something that allows that to happen. We just have to learn what it is and maybe the same thing could throw off the HIV virus. Is that why you said “irradiation,” rather than mentioning the potential for a vaccine for kittens? I think that it’s understandable, to attribute most of the funding -not all- to our social interaction with contributors who have a vested interest in furthering their own species. Perhaps not that of the domestic cat. But then, some do. I did a bit more research and learned Cornell has a Feline Health Center where they study all things cat. So this research was geared toward helping cats. Let’s hope that finding out how to treat FIP effectively will not take long. Discovering the cause is only step one, but it gives us hope. Well, Harvey, do you know what Cornell (University) has accomplished heir? They were the institution to begin the research on this coronavirus with full authority, b/c they had the best brains, if you will, and the prestige, maybe, to begin this research into FECP. Later, what we now know as the killer FIP. What Excuse me, Harvey? I’m waiting for Elisa or my own sister to come back on that comment. Michael, are you playing with me, creating some sort of virtual stupidity within PoC? what gives, Harvey. damn, I should have left when I said i would. I am going to respect you, H. Because you certainly are well-traveled.